I don't ever feel like my makeup is complete without highlighter. Even I'm just going to the grocery store, I wear highlighter. I want highlighter for daaaaays. I want to be able to see it from space. I mix up the colors and shades that I wear, too. In the winter, I use a deep brownish highlighter. In the summer, I'll use a lighter one. I also like pink highlighters, and I use blue or purple when I'm going out. I went to a May the Fourth Star Wars party and did galaxy eyes with pink, blue, and purple and used a blueish purple highlight. While I wouldn't wear it every day, it did look amazing. Have you tried layering highlighter? It's fun playing with different colors to create whole new looks. I do this when I'm going out just to give myself a new look without buying new product. Because one can only have so much makeup in her stash before she runs out of room! Hard Candy recently sent me four of their new Baked Highlighter Trio palettes. Oh em gee they are gorgeous. 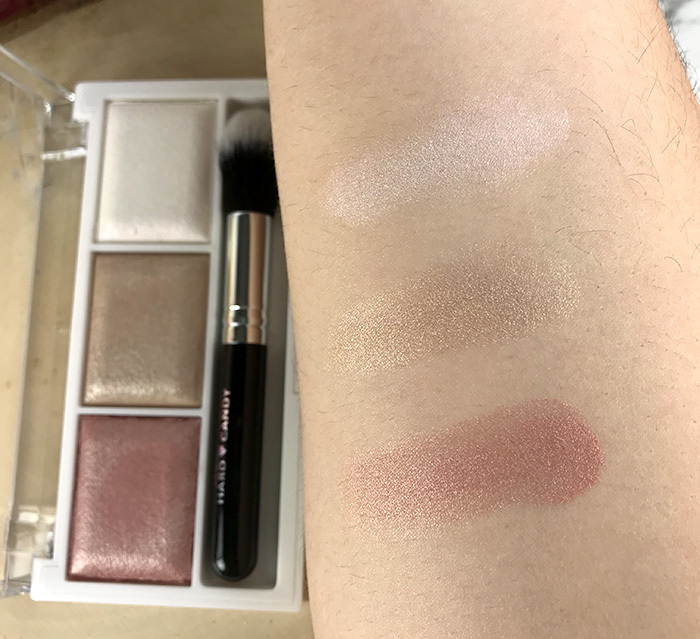 Each palette has three coordinating shades of highlighter and retails for $9. Hard Candy is listed as cruelty free according to Phyrra, which is a major bonus for me. The palettes each have three colors. Each color has 0.1 ounce of product. That doesn't seem like a lot, but a little really goes a long way, so this should last for several months if you use each color equally. The colors go on sheer, so you'll need to build them up if you want your highlights to really pop. You can also apply them wet for a deeper shade. Each palette also comes with a short tapered brush. I generally don't find the brushes that come with makeup to be decent, but this is an exception. While I prefer my dedicated highlighting brush, this is a good brush. If I were to travel, I would be comfortable using this to pack light. This one quickly became my go to highlighter. 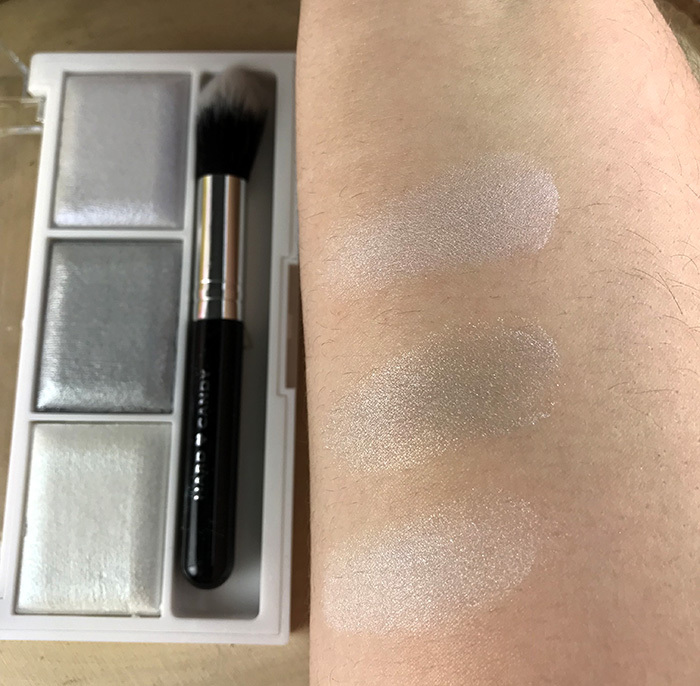 It has a light, medium, and dark highlighter in a beige shade with golden undertones. With my dark hair and eyes, this works well with my skin tone. The top color makes an excellent bronzer for light to medium skin tones. The middle color is stunning in person! This is also a great every day highlighter palette. It has an almost white shade, a mauve/brown shade, and a mauve. Layer the dark and light colors looks amazing. The lighter two colors in this palette are gorgeous alone or layered with other colors. The darker color is a bit too dark for me, but I bet it will be awesome on darker skin tones. 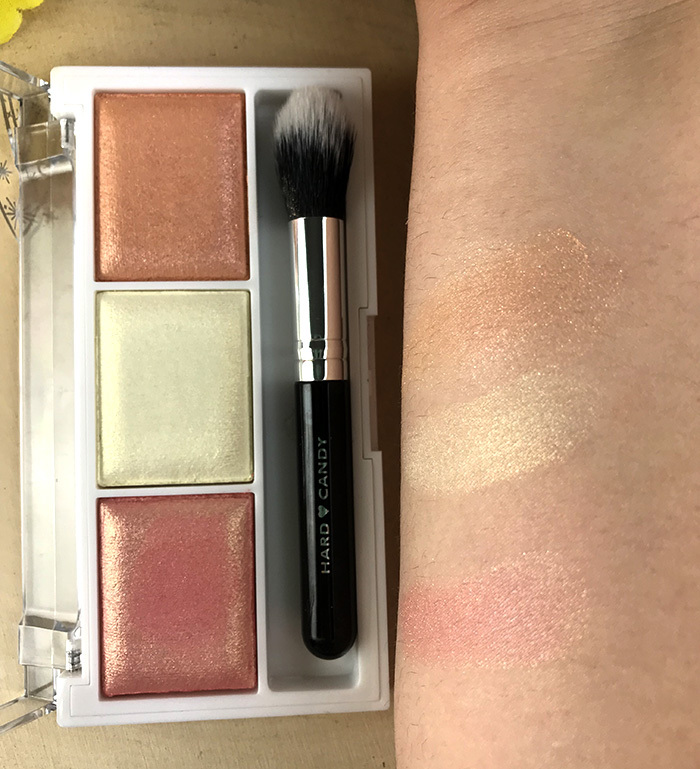 This is a bright palette, perfect for summer. It has a yellowish light shade and two warm pink/coral shades. It's really pretty. I also wear this one often because the colors look great on my skin tone. For a more dramatic look, try this one. It has an almost white highlighter, light gray, and dark gray. I haven't layered these yet, but I think they will look amazing with other colors. To be honest, I probably wouldn't have bought this one, but it is stunning. I'm glad I got to move out of my comfort zone a little bit with this palette. 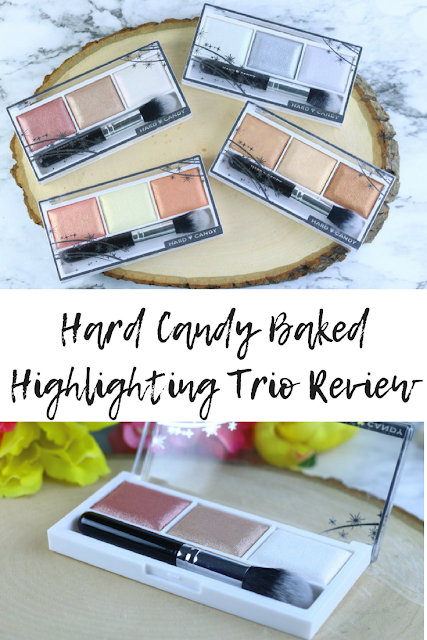 Hard Candy is also sponsoring a giveaway! 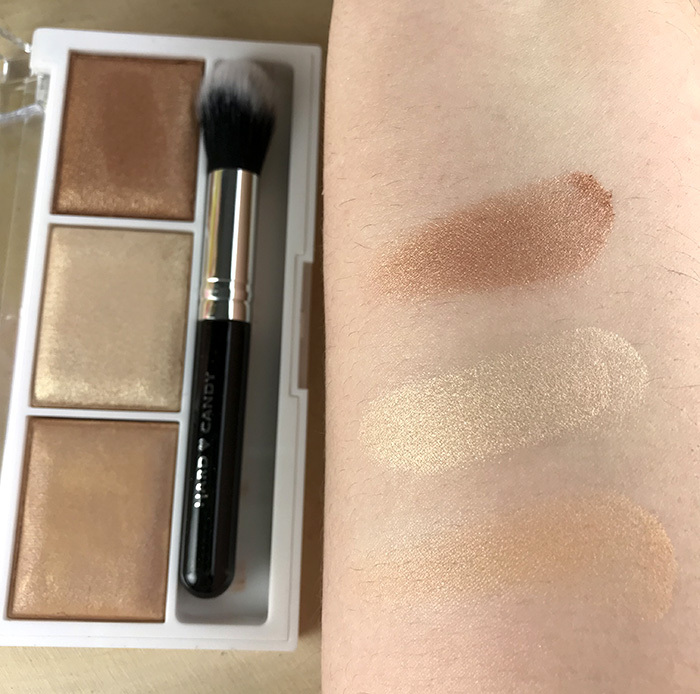 One of my lucky readers will one one set of four Baked Highlighting Trio palettes. Good luck! Contest open to US residents ages 18 or older. Void where prohibited by law. Good luck!